It’s easy to get swept up in the excitement of buying an Arizona home. Once you’ve had an offer accepted on your dream Arizona house, you’ll probably be anxious to move in. However, before you make a significant financial commitment, it’s best to know exactly what you’re buying. Overall, does the home appear to be well maintained? Unless it’s a highly-competitive seller’s market, consider the overall condition of the property BEFORE you submit an offer. Work with your Arizona real estate agent to factor in repairs and updates you know you’ll need to make when you determine your offer price. Make every effort to be on-site during the inspection. Buyers who aren’t present during their inspection miss out on a great opportunity to gather valuable information about their new Arizona home. Of course, if you do choose to tag along with your inspector, exercise good judgment. Don’t get in the way, become a distraction, or do anything to jeopardize your (or the inspector’s) safety. But it is a great time to check out how certain items may operate and safety issues such as where the water shut off valve is located. If you can’t make it to the inspection, ask if you can schedule a time to meet in person or speak by phone to go over the report in detail. You are paying for the inspection, be sure to get your questions answered. Don’t get so caught up in the house that you miss important details such as a roof that may need replacing. Speaking to the inspector will give you an opportunity to ask questions or request clarification about issues in the report you don’t fully understand. Your inspector may also flag some minor items that you wouldn’t typically expect a seller to fix. However, ignoring these small issues can sometimes lead to bigger problems down the road. Make sure you read everything in the report so you can take future action if needed. Compare the report to the seller’s disclosures and think about areas of concern that may need further inspection. Some buyers are too embarrassed to ask questions when there’s something in the inspection report they don’t understand. Ask both the inspector and your Arizona HomeSmart REALTOR® to help clarify any questions. If you still have questions ask your agent to help find clarification so you fully understand. You do not need a home that has the potential to have major issues down the road. Don’t be afraid you might look foolish and avoid asking questions and end up uninformed about important issues that could impact your home purchase or future repairs to the property. Should I have another professional evaluate this? Don’t bother asking your inspector if you should buy the property, because he/she won’t be able to answer that question for you. Instead, use the information provided to make an informed decision. A skilled real estate agent can help you determine the best path and recommend other inspections you may need to consider, such as a roof inspection or pool inspection. Some Arizona home buyers get scared off by a lengthy inspection report. But with around 1600 items on an inspector’s checklist, you shouldn’t be surprised if yours uncover a large number of deficiencies.4 The key is to understand which problems require simple fixes, and which ones will require extensive (and costly) repairs. Your real estate agent can help you decide if and how to approach the sellers about making repairs or reducing the price. Whatever you do, try to focus on the major issues identified in the inspector’s report, and don’t expect the sellers to address every minor item on the list. They will be more receptive if they perceive your requests to be reasonable. At the same time, don’t forgo getting something repaired that will affect your ability to live in the home comfortably. Every home is different and so is every sale and negotiation. There are times when an agent or inspector will recommend bringing in a specialist to evaluate a potential issue.5 For example, they may suggest testing for mold or consulting with a roofing expert. Do the pool appear to need resurfacing? How long can it last? Some buyers get spooked by the possibility of a “red flag” and decide to jump ship. Or, in their haste to close or desire to save money, they choose to ignore the recommendation for additional testing altogether. Be prepared to have additional inspections and then if you don’t need it you didn’t skimp and can feel confident buying your new Arizona home. 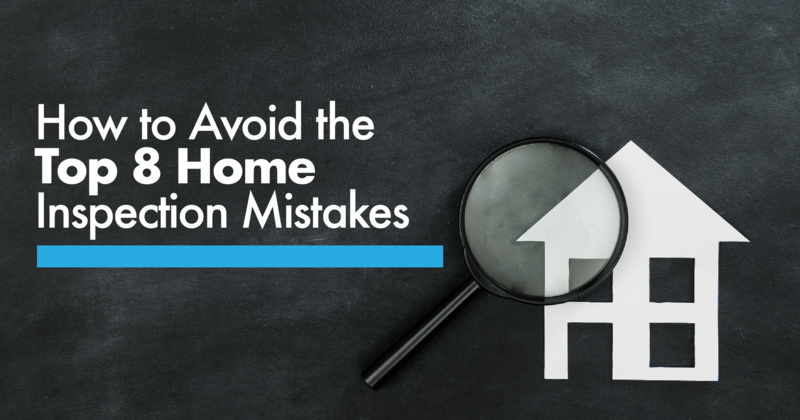 Don’t make these potentially costly mistakes. In some cases, the specialist will offer a free evaluation that takes minimal time to schedule. And if not, the small investment you make could provide you with peace of mind or save you a fortune in future repairs. You want to be sure the major components of the home are in overall good condition and that you can expect them to last. While the majority of sellers are forthcoming, some will try to save money by cutting corners, hiring unlicensed technicians, or doing the work themselves. A re-inspection will help ensure the repairs are completed properly now, so you aren’t paying to redo them later. Ask your REALTOR® if the repairs are ones that needed to be completed by a licensed and bonded professional. When hiring REALTOR® a be sure that agent has time in the business and has completed many home sales and attended home inspections this way you know you are getting the best advice possible. Make sure the agent will be available to answer your questions throughout the transaction. If you’re in the market to buy an Arizona home, we can help you navigate the inspection and all the other steps in the buying process … typically at no cost to you! Tap into our expertise to make the right decisions for your Arizona real estate purchase. Contact us today to schedule a free consultation! HomeSmart Arrowhead sells homes and helps buyers throughout the Metro Phoenix area including Glendale, Phoenix, Peoria, Surprise, Avondale, Goodyear, Tolleson and Litchfield Park. Our team members also help with home sales in Scottsdale, Fountain Hills, Mesa, Tempe, Chandler, San Tan Valley and Gilbert. Peggy Elias is a HomeSmart Agent in Glendale Arizona.